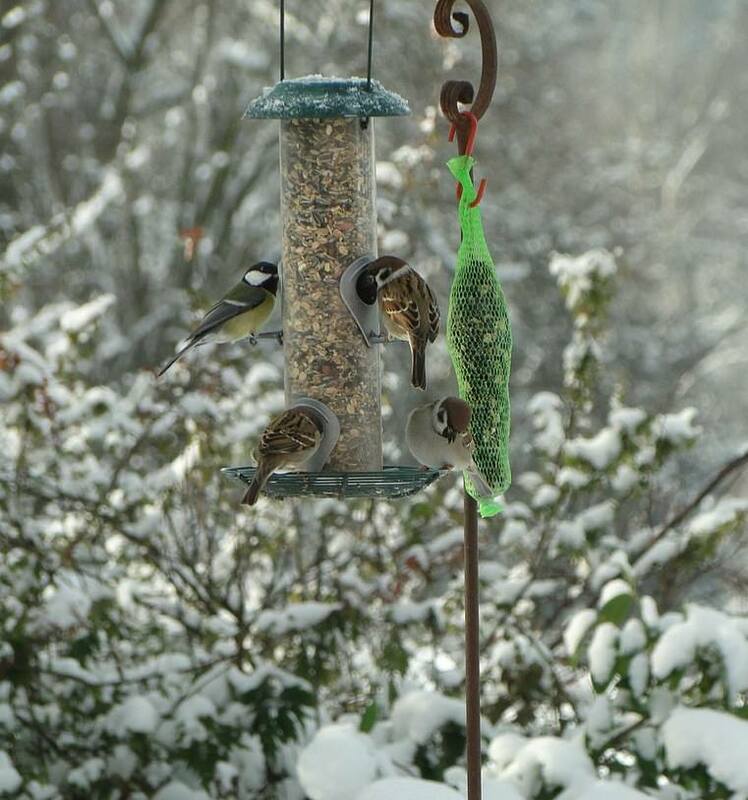 Choosing the best bird feeders for finches doesn’t have to be a difficult decision. 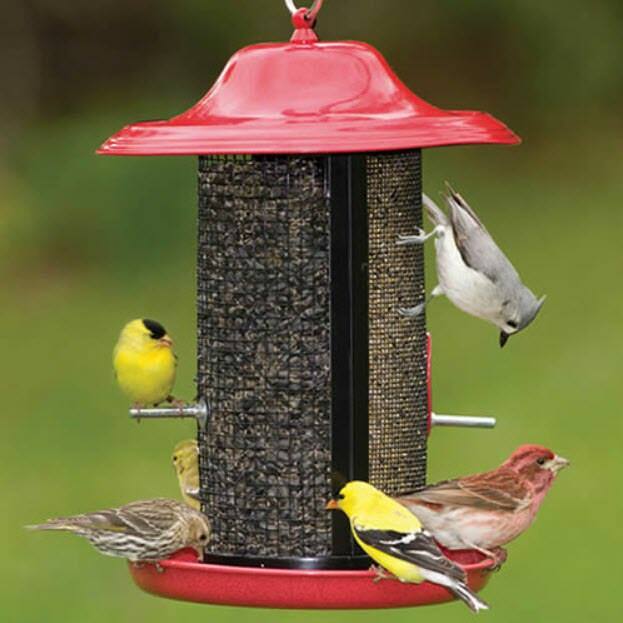 When looking at the wide variety of feeders available, it can be easy to get overwhelmed. Take the time to learn more about these interesting and popular birds. You can then narrow down the choices to find the best finch bird feeder for your yard. Bird lovers have delighted in the show put on by these small but mighty creatures for centuries. These lovely bursts of color and song were often caged for the amusement of wealthy aristocrats. Aviaries were full of chattering finches flitting from one branch to another. While some finches are still kept caged, most roam their natural habitat in the wild – as well as visit well-placed finch bird feeders in backyards. Finches are common throughout most of the United States and southern Canada. They spend the warmer months in the northern climates and migrate south in the late fall and winter. It is not uncommon for some birds to overwinter in cooler areas with a lot of available food sources. Most finches are in the 5 to 6-inch length range, but they come in a wide variety of colors. 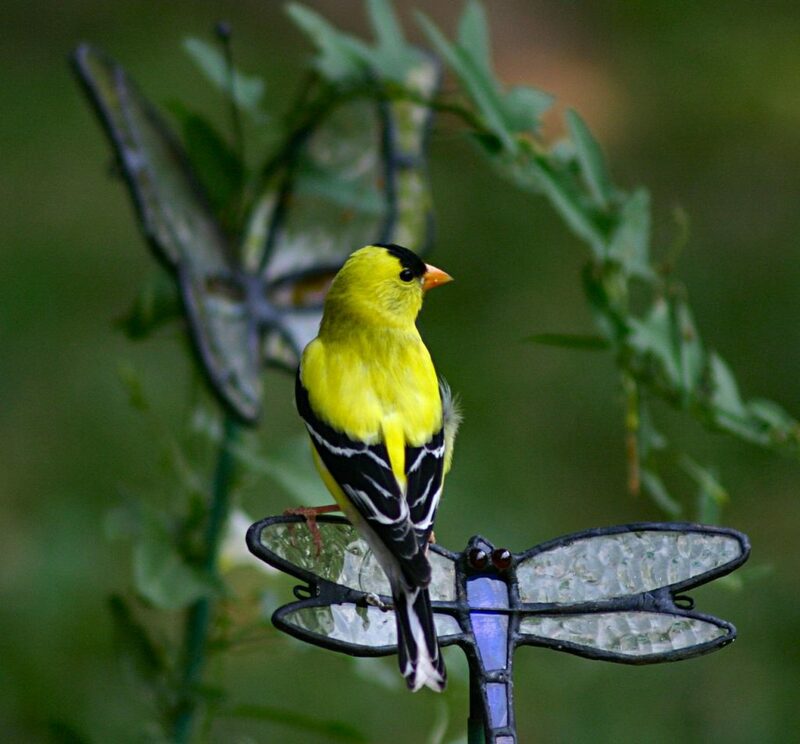 The American Goldfinch with its bright yellow, white, and black plumage is one of the most recognizable. 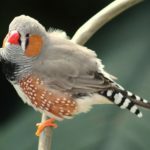 Others such as the Purple Finch, House Finch (orange, red, and yellow), Plum Headed, and Zebra Finch all add their own unique coloring to the mix. 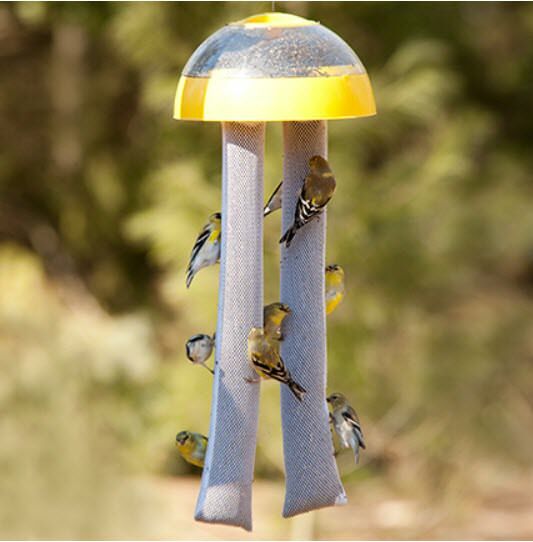 The most popular feeders for finches are the mesh feeder, sock feeder, and tube feeder. Finch feeders will also come in a hopper style, but they don’t seem to attract these birds as well as the other styles. You might have to experiment with placement and style to find which feeder performs best in your backyard. Below are a few top picks. Stokes Little Bit Finch Feeder – A wide mouth on this hard-plastic mesh feeder makes it easy to clean and fill. The bright yellow color attracts the birds while the sturdy, rust-proof material holds up to the weather, wear, and tear. It is a simple, pleasing design that works well with any decor and in any location. 2. 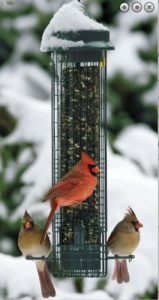 Red Rock Twin Feeder – With a unique two-chamber design, this feeder from Duncraft allows you to offer two kinds of seed to your feathered friends. Drainage holes in the bottom along with a built-in seed diverter, help keep the seed fresh and constantly moving. With perches, a screen, and a tray, there are multiple feeding options offered to a variety of birds along with the finches. 3. 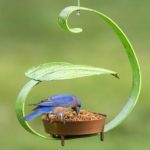 Kaytee Finch Station 2 – This simple, but well-designed feeder is a great pick for anyone who wants a large number of finches to be able to eat at the same time. The two sock bags will hold over 7 pounds of seed. 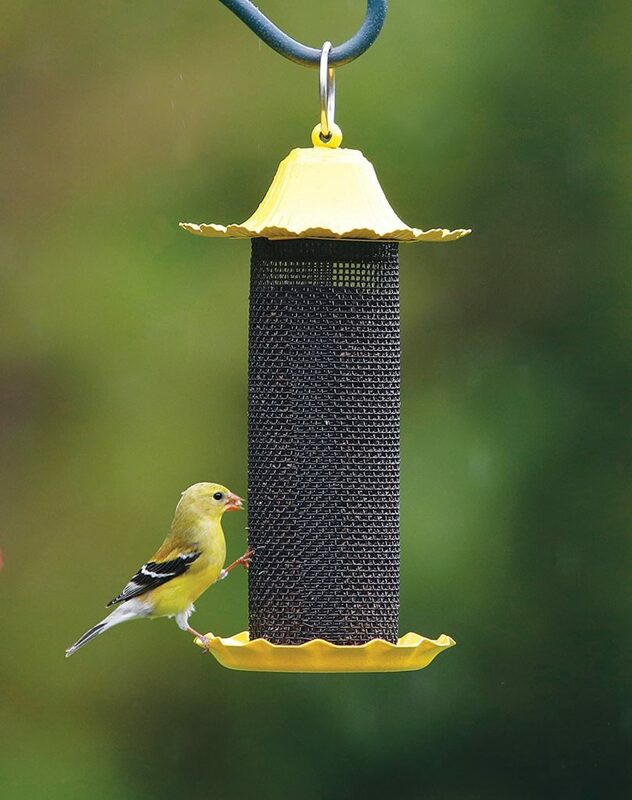 Designed for thistle seed, it allows the finches to cling to the bag while eating. It also makes it easy for them to eat upside down which seems to be a favorite dining position for finches. A domed, plastic shield or baffle, over the top, helps keep the rain off of the seed. 4. 25 Ounce Super Finch Sock Feeder – The bigger capacity of this sock feeder makes it an economical choice. It is an instant feeder in that it can be hung up and presented to the birds as soon as you get it. 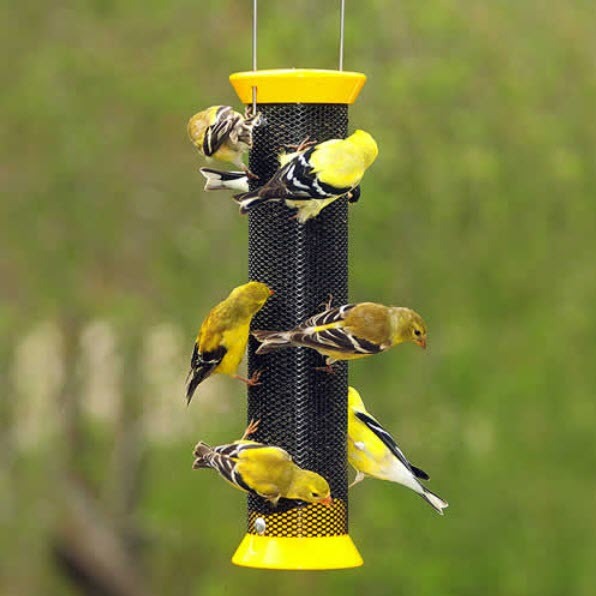 Finches and other small birds such as siskins are immediately attracted to it. This sock feeder is also easy to refill. 5. 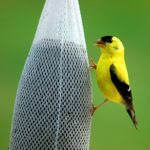 Droll Yankees Metal Finch Sock – With a 1-pound seed capacity, this unique and durable metal mesh feeder is as easy to fill as a tube feeder. The black, powder-coated mesh tube provides a perfect perch as well as a nice backdrop to watch the colorful finches eat. This feeder boasts diamond-shaped openings instead of circular holes to allow easier access for the birds’ beaks. 6. Squirrel Buster Classic Wild Bird Feeder – Tube feeders are a top pick among bird watchers. One of the main attractions of this particular model is the fact that it is guaranteed both chew-proof and squirrel-proof. Rodents and other wildlife are often a major issue for bird feeders. This feeder also has a built-in ventilation system that allows heat and moisture to escape through the top. This reduces the chance of mold in the tube and helps keep the seed fresher. It is also easy to clean. 7. 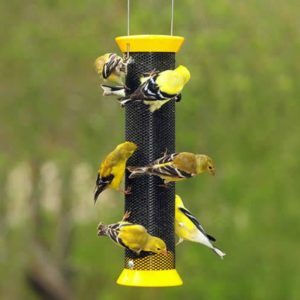 Yellow Spiral Finch Feeder – With 18 seed ports on this fun and attractive 17-inch feeder, you’ll have finches covering it as soon as you fill it up and hang it. The rust-resistant yellow metal top and bottom are easy to remove for cleaning and refilling and seal tightly to help deter squirrels and other rodents. One pound of Nyjer seed will fill the feeder. 8. 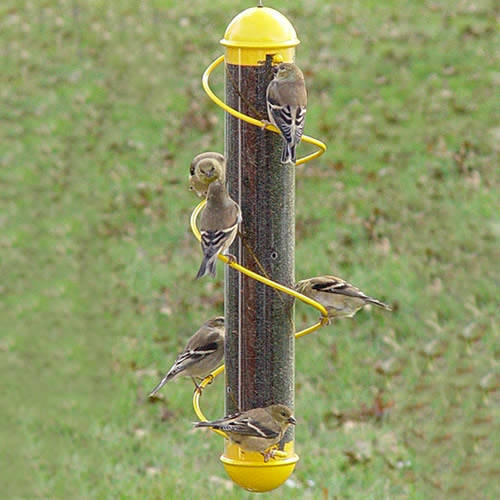 Finch’s Favorite 3-Tube Feeder – 24 finches can eat at one time at this triple-tubed feeder. This simple tube feeder holds up to 1 pound of seed in each of the three plastic tubes with built-in perches. 36 feeding ports allow the birds to choose how they want to feed. Easy to clean and easy to refill, this feeder will easily live up to the title of “finch’s favorite” as you can tell from the video below. The natural diet of most finches is grain and seed. In the wild, finches cover a large area searching for various types of this food. They feed on a wide variety of flowers, grasses, and weeds. It is not uncommon for them to eat the small buds off of trees and bushes. Tiny insects are also eaten during the summer months, but the staples of a finch diet are always grains and seeds. When filling finch feeders to attract these birds to your backyard, your choices aren’t quite as unlimited. You will come across many mixtures and blends designed to attract either a single species or a wide range of birds. Unfortunately, many of the mixes have ingredients that appeal more to the squirrels than they do to the birds, especially finches. There may be a lot of waste with these blends as the birds will toss unwanted seeds to the ground. 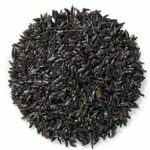 If your goal is to attract finches, there are two favorites that will get and keep their attention – thistle (Nyjer) seed and black oil sunflower seeds. Seeds from milk thistle or the similar Nyjer plants are easily the most favorite food of finches – in the wild or from a bird feeder. These seeds are high fat and packed full of protein for that extra energy these little birds require. Thistle is best used in actual finch feeders as the holes and perches are smaller to keep larger birds from eating all of the seed. This energy-packed seed is also a great choice for finches. The thinner shells allow for easier consumption by the smaller birds. 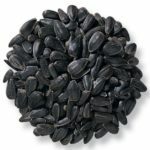 Feeding the sunflower seeds in hopper, tray, or tube is the easiest way to offer them. Be warned that black oil sunflower seeds are a favorite of most birds. You will have a lot of visitors to feeders that aren’t designed solely for the finches. Position your hanging feeder out of strong winds to reduce the swaying of the feeder. Be sure it is not in a high-traffic area where it will get bumped around. During violent, stormy weather, it may be advisable to take it down temporarily. Place feeders either 3 feet away from windows or over 25 feet away. The area in between is the danger zone for birds building up momentum and flying into the glass. Make sure the feeder is securely attached to its support. This can be a branch, gutter, hook, or pole as long as it is sturdy and able to hold the weight of a full feeder. Small chains and S-hooks are a good way to hang them. A rope or cord can also be used as long as there is no give or elasticity. Hang finch feeders in areas with light shade and nearby cover. Aside from making it hard to view birds, full sun will also damage your feeder over time. Ideally, the feeder will be positioned at least 5-6 feet off the ground. Having nearby cover in the form of trees and bushes will help attract the birds to your yard. Do regular cleaning and maintenance on your hanging feeder. Inspect the cords or wires that support it for damage. Clean the feeder at a least every few weeks to ensure it is not harboring any harmful bacteria or disease. Installing a baffle over the top of your feeder can help keep the seed dry as well as deter some pests. Some feeders come with one already attached. Now that you’ve learned how to choose the best bird feeder for finches, it’s time to get started. It will only take a few days or in some cases, a few hours for your new friends to find the bird buffet. In return for a few well-placed feeders full of seed, the finches will provide you with hours of enjoyment and entertainment.